In Spain, the kale trend is nowhere as strong as in the United States, where it is becoming the true 'food revelation' of 2019. In the Iberian country, there is another vegetable that is more highly recommended, especially by celebrities. We are talking about artichokes. Television, gastronomy and even the Royal House are united by this flower of infinite properties. For example, a few days ago, Queen Letizia confessed at a reception with agents from the agricultural sector that she loves artichokes. 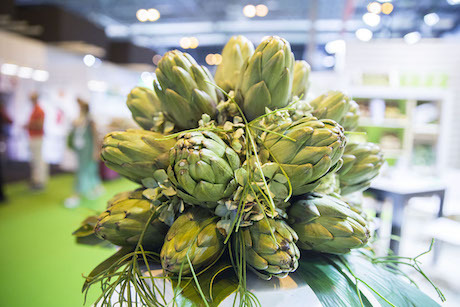 "She said she's crazy about artichokes, and I told her that she would receive a box in La Zarzuela on Monday," said Juan Marín, president of Proexport. The Queen is not the only Spanish celebrity who loves artichokes, because a few weeks ago, chef Karlos Arguiñano confessed in an interview with El País that he's also very fond of this food. Another Spanish television personality with a devotion to this herbaceous plant is presenter Carlos Sobera, who praised the qualities of the "great artichokes" of "La huerta de Tudela", a restaurant located in Madrid, in the Repsol Guide. For her part, actress Paula Echevarria also praised the virtues of artichokes. She's cited in the menu of a restaurant as having said that "these are the best artichokes with ham that I've ever eaten!" She was referring to those that are cooked in the restaurant Iruña, located in Logroño. It is clear then that Spanish celebrities have a close relationship with this fundamental food in any healthy diet. But what is the true secret behind its success? One word: properties. Artichokes are an excellent source of calcium and phosphorus, although they also contain other minerals, such as potassium, iron, magnesium and zinc. It also contains vitamin B1 and small amounts of vitamins C, B3, B5 and B6. As for its health benefits, artichokes cleanse and eliminate fats and cholesterol. And that's not all. Artichokes are also "healthy" for the country's economy. Spain produces some 220,000 tons a year, according to figures provided by the non-profit association Artichoke of Spain. This amount includes both the artichokes intended for fresh consumption and those going to the canning industry. Faced with this, the kale phenomenon has just arrived, aiming to conquer an unexplored market. It is a new vegetable in Europe, consumed by a minority if we compare Europe's volumes with those reached in the United States, where even President Obama planted an organic garden with this cabbage (which belongs to the same family as broccoli, cauliflower and Brussels sprouts). Ever since, we haven't stopped seeing famous Americans promoting the health benefits of kale. After the president, we got Gwyneth Paltrow, who's already experienced in the promotion of healthy lifestyles. After that, the number of fans has been rising unstoppably. Beyoncé printed the word kale in a sweatshirt; Jennifer Aniston has said that it is an essential ingredient in her diet; Kate Winslet has been photographed with handfuls of Kale... even National Kale Day is a thing now! In short, kale won't take too long to carve out a niche in our diet, so we should know what it can offer us, compared to other vegetables. The most important to know is that it is rich in calcium and iron, it has plenty of vitamin C, vitamin K and vitamin A and it also contains flavonoids and carotenoids. Furthermore, kale is rich in omega-3 fatty acids and also has a lot of fiber. Thus, artichokes and kale offer complementary benefits which, when combined, contribute to maintaining a hugely healthy diet. Celebrities know it; in Spain with artichokes and in the United States with kale. All that's left is for both gastronomic trends to blend so that everyone can experience the most ideal diet.